Naturally Exhausting Stale Air...No Power Required! 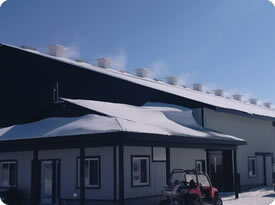 Sun-North’s chimneys exhaust moist, stale air from the building envelope. They come in different inside dimensions and various custom lengths. White is the standard colour for the one piece poly roof. Each chimney comes with metal roof flashing (bone white). All hardware is included and can be shipped assembled or knocked-down. Stainless steel torsion springs and hardware. 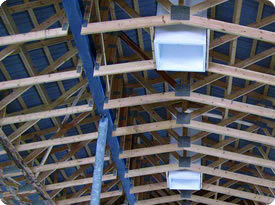 One piece anti-buckling poly roof. Wind direction does not affect operation. Baffle control for easy adjustment. Restricts snow and rain entry. 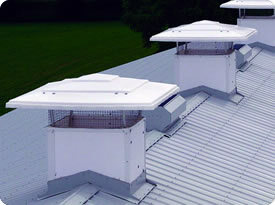 Sun-North chimneys have a minimum ventilation gap when chimneys are fully closed of 3/4” (1.9cm) to adhere to ventilation standards.